As director of Personnel and Member Care for AGWM, Rick Johnson is responsible for implementing the missions application process and providing training for all missions personnel. He also oversees member care for missionaries and their families and directs the Missionary-In-Residence program at AG colleges and universities. Throughout his childhood, Rick had plans to pursue a career in law enforcement. At age 16, he accepted Christ after reading Run Baby Run, the salvation account of former gang member Nicky Cruz. After graduating from high school, he went on to earn an associate degree in police science from MiraCosta College in Oceanside, California, intending to become a criminal investigator. But an encounter with God soon led to a change in his life’s focus. During a time of prayer, he sensed the Holy Spirit asking him, “If I call you to be a missionary, will you go?” Rick had never met a missionary or attended a missions service, but he knew the question demanded an answer. In 1978, Rick married Ruth Delgatty, daughter of Verdun and Rhoda Delgatty, who served many years as Assemblies of God missionary evangelists. 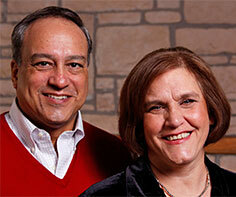 The Johnsons were appointed as AG missionaries to the Dominican Republic in 1985. After learning Spanish, they quickly became involved in evangelism, church planting and Bible school ministry. Rick also served as national director of ICI University, taught at Caribbean School of Theology and was coordinator of Baseball Chapel, an international ministry to Major and Minor League baseball players. He was named area director for the Caribbean in 1997 and served in this capacity for six years until his appointment as director of Personnel and Member Care in 2003. Rick completed his undergraduate studies at Seattle Pacific University, graduate work from the University of Washington, and a doctorate from Assemblies of God Theological Seminary. He and Ruth have three adult children, and seven grandchildren.